This summer we travelled to Cornwall to collect six chough chicks from Paradise Park. Whilst we were there we took the opportunity to meet up with Claire Mucklow, RSPB Cornwall chough project manager, and Nicola Shanks, RSPB chough project officer. They very kindly drove myself and Harriet around the picturesque countryside in the hunt for the Cornish legend that is the red-billed chough. Choughs have a long standing history with Cornwall dating back to the 13th Century and even feature on its coat of arms. In the 19th Century the population of Cornish choughs came under immense pressures from egg collectors, people shooting for fun or misidentifying them as pests, and people taking chicks to tame as house pets. All that on top of the continually degrading habitat in which livestock were being moved inland for easier farming leaving once grazed cliff top pastures to become overgrown and unmanaged. 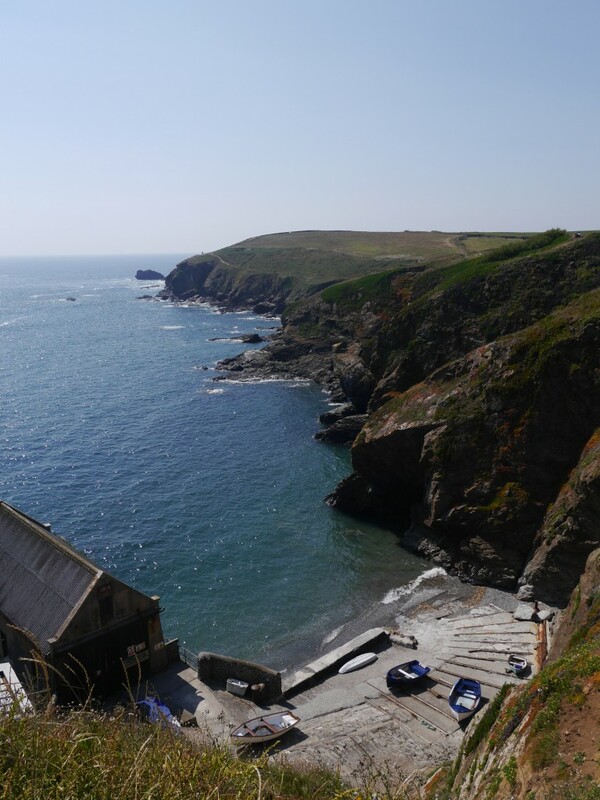 The three birds who returned in 2001 chose Lizard Point on the south coast of Cornwall to become their new home. 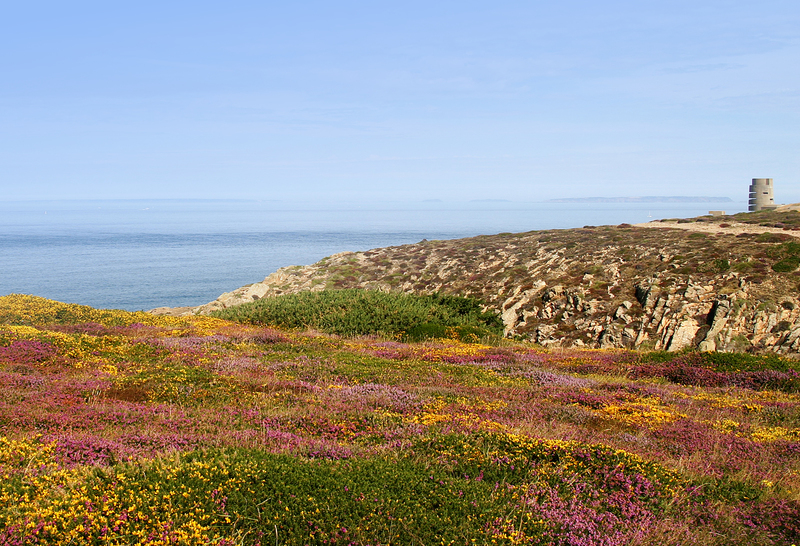 With suitable grazing and dramatic cliff tops it is easy to see why. As part of their conservation management Claire organises volunteer nest watches each year so the eggs and subsequent chicks can receive round-the-clock protection. Sadly, egg-collecting still threatens choughs and many other species today. In 2006 police seized a collection of over 7,000 wild bird eggs including chough, the largest case to date. For more information on this case click here. A volunteer chough watch point at The Lizard this year manned by National Trust (in red). Photo by Liz Corry. Choughs are protected by UK law to the extent that a licence is needed in order to photograph and access nests. The volunteers watch from a distance and gauge breeding activity according to what the parents are doing. With an incubation period of around three weeks and a further six to seven weeks before the chicks leave the nest, the volunteers are often in for a long wait to see the chicks fledge. Happily the breeding success and survival of these Cornish birds is very good. It doesn’t have to be the breeding season for you to see choughs at Lizard Point (although from personal experience it helps!). And don’t be put off by the thought of standing out in blustery, icy winds at this time of year. The Polpeor Café has a great view and heating. You can get even ‘warmer’ by stopping off at The Witchball in the village and sampling the delights of the Cornish Chough Brewery. Cornish Chough Brewery ales on tap at The Witchball. 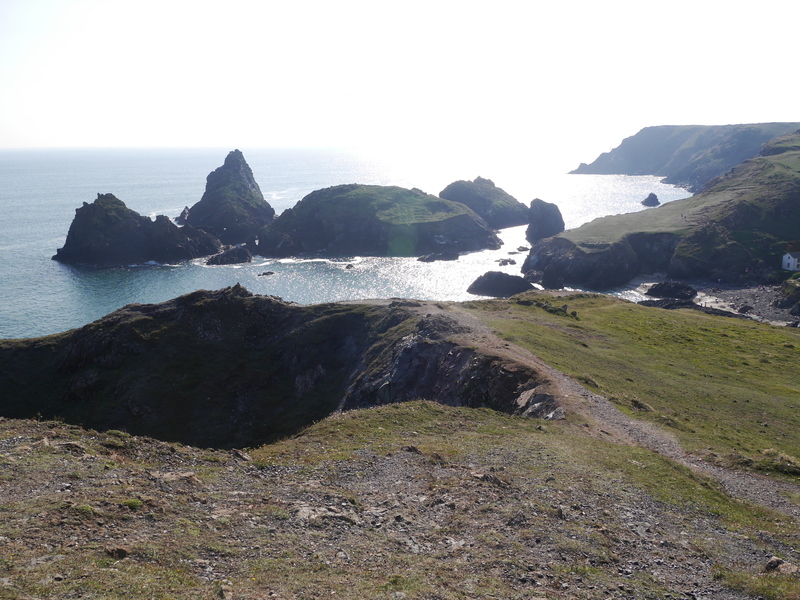 Just north of Lizard Point is Kynance Cove a very popular destination in summer for both people and choughs. 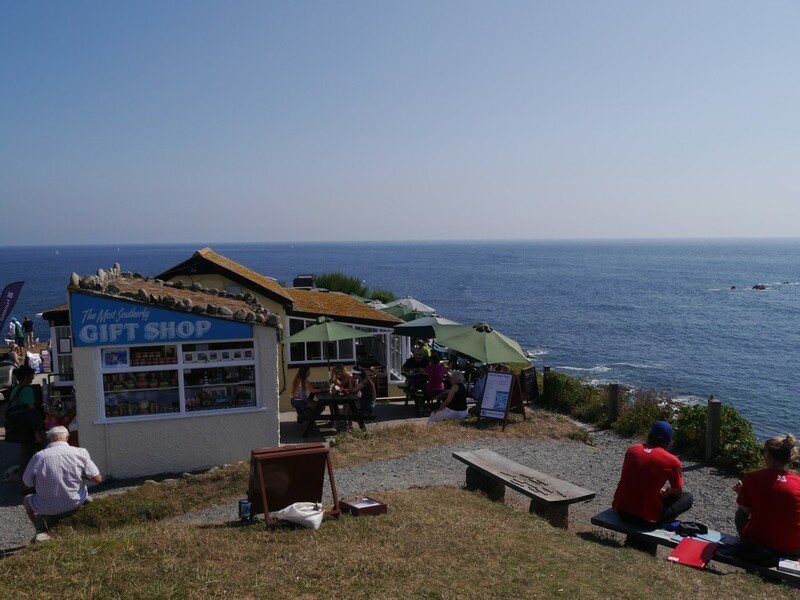 People are attracted to the turquoise water, white sands, and café cream teas. The choughs…cow pats. 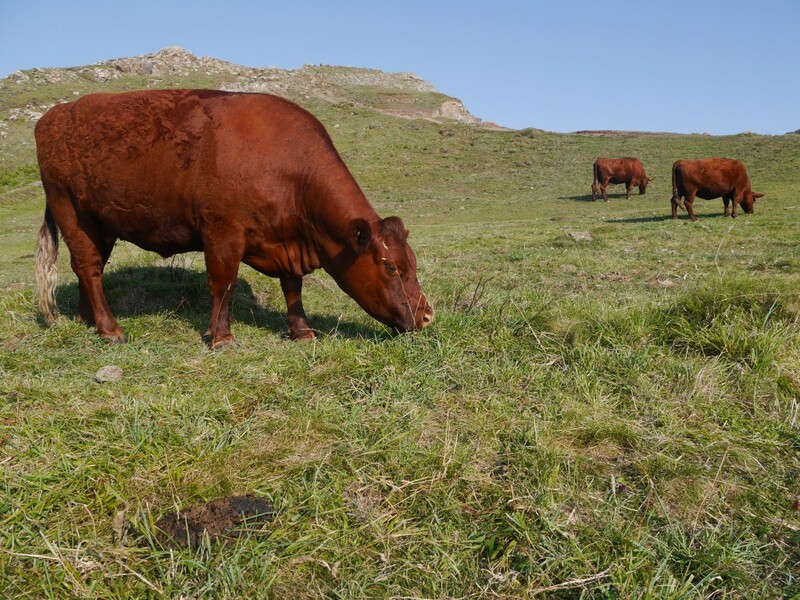 In 2010 local farmer Roland Hill, in partnership with Nature England and the National Trust, started grazing ruby red cattle (sometimes, and whisper this, called North Devons) at Kynance and Lizard Downs in order to restore the coastal grassland including rare plants such as spring sandwort. Of course they also benefit the choughs by allowing insect communities to thrive in the grazed land and their dung provides an almost endless supply of beetle larvae. Ruby reds happen to be one of the most docile and prettiest breeds of cattle, Jerseys aside of course, which make them quite an attraction in their own right at Kynance. 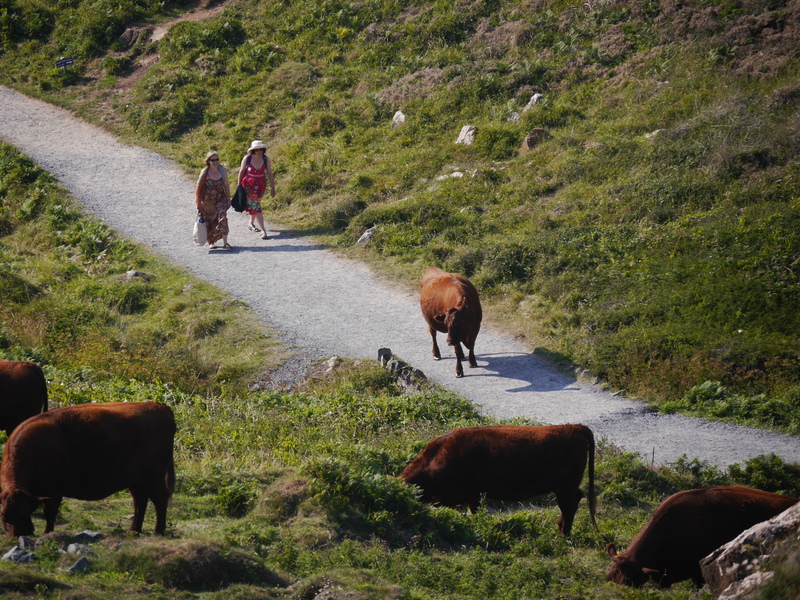 Ruby red cattle grazing the cliff tops at Kynance Cove. Photo by Liz Corry. Ruby reds grazing in amongst the visitors to Kynance Cove. Photo by Liz Corry. As chough numbers started to increase the birds began slowly dispersing further along the coastline. 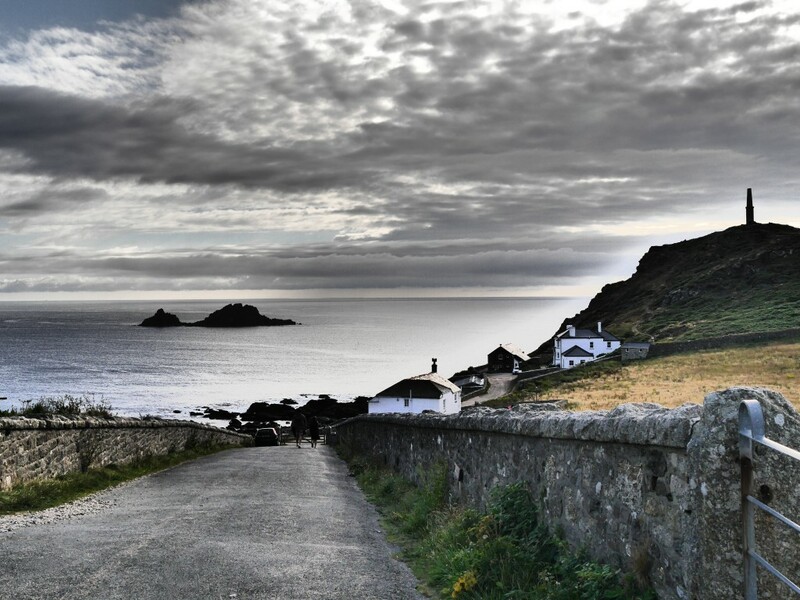 An hour’s drive west of Lizard Point is Cape Cornwall and where we based ourselves for the two day trip. 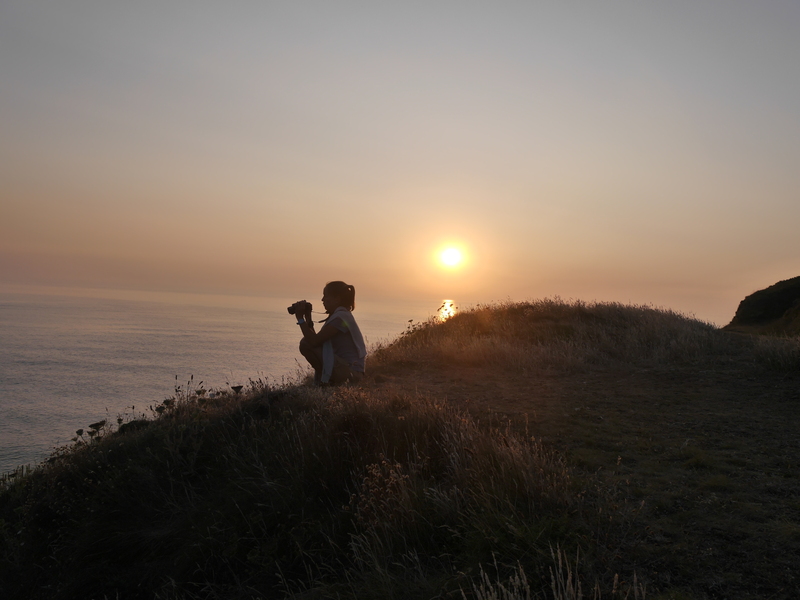 We asked Nicola to recommend accommodation in the area with a tongue in cheek challenge to find somewhere we could photograph a Cornish chough with the sun setting in the background over picture perfect calm seas. Hats of to her she did it, but I don’t think Nicola expected us to be quite so lucky (Claire says she did. It was test to see if we were going to put beer or choughs first that evening!). Cape Cornwall and a view of the Heniz Monument. Photo by Liz Corry. 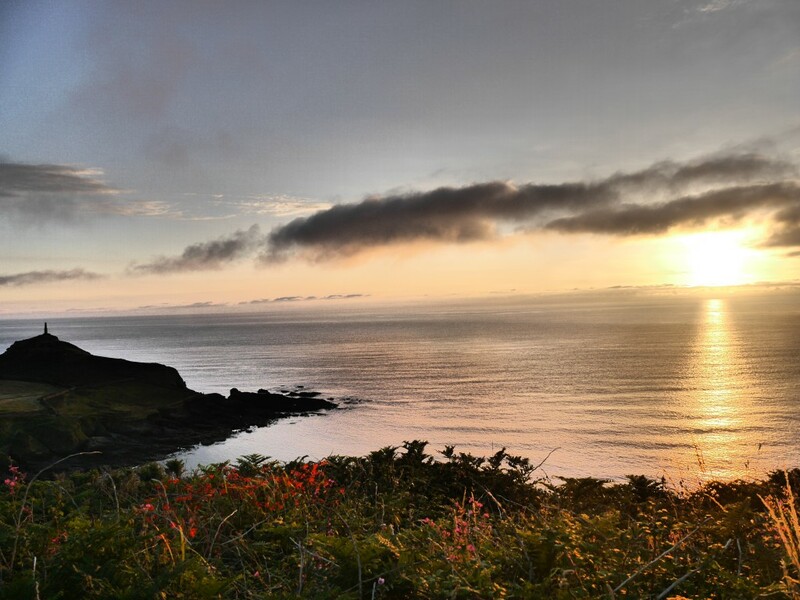 After checking in at the hotel on the first evening we walked down to the end of the headland to Heniz Monument. 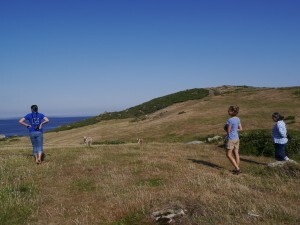 Very soon we heard the unmistakeable call of a chough and, on following the sound, spotted three birds coming in to land. 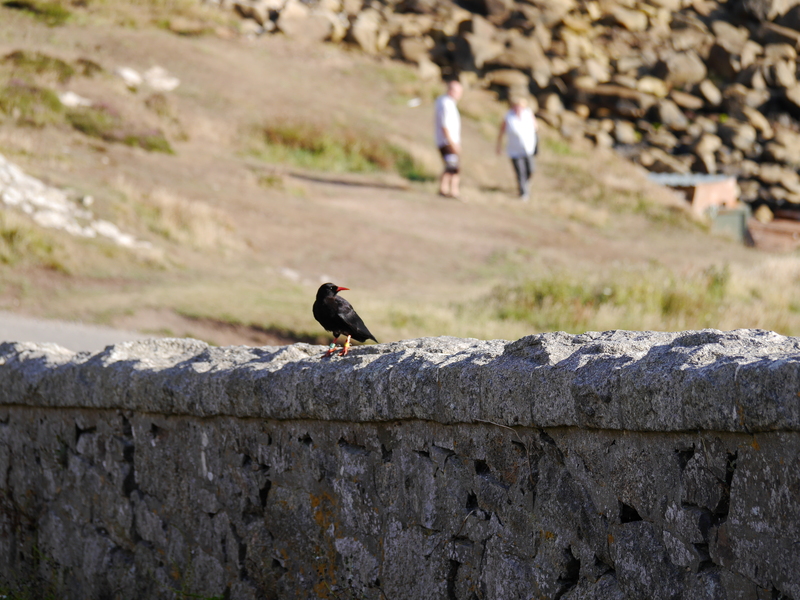 Oblivious to the two over-excited, binocular clad, girls jumping up and down twenty five metres away, the choughs went about their business foraging in the grass around the headland and preening on the wall surrounding the pubic car park. After a while the choughs took to the air and flew off north. As we watched the birds disappear into the distance we began to make out tiny black specks on the slopes below Kenidjack. Following the footpath around to get closer the tiny specks began to take shape and we soon realised we were looking at choughs. Not just dirt on the lens or rabbit holes (trust me it happens). Choughs gathering near a communal roost site. Photo by Liz Corry. In total we counted fourteen choughs scattered across the rocks on the other side of the valley. We sat and watched them until the sun had set. Clearly we had found a communal roost site and had been fortunate enough to watch them all bed down for the night. The next morning when we met Claire we worked out that we had been observing two family groups and the all male pairing. During the breeding season these three groups tend to keep their distance from one another. Once breeding is over groups will flock together sharing roosts and feeding sites. 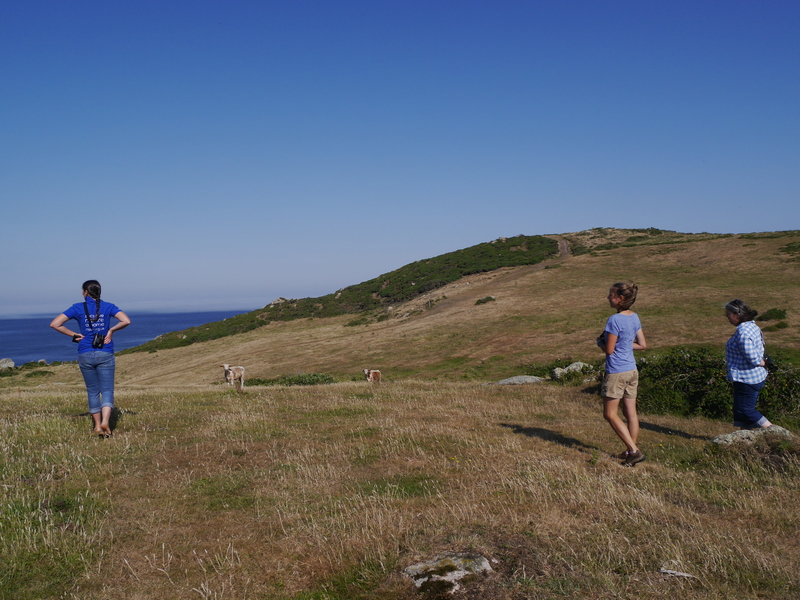 To help us learn more about the habitat preferences of the choughs Claire and Nicola drove us to sites either side of Cape Cornwall. Our first stop was an area called Nanjulian where longhorn cattle are being used to graze the headland. The farmer here is so pleased with the way things have gone he is looking to expand is herd although as with many projects of this kind he is limited by time and resources. Slightly less huggable in appearance than ruby reds, yet just as likeable and important, the longhorns keep the grasses short, scrub at bay, and allow the insect comminuties to thrive. 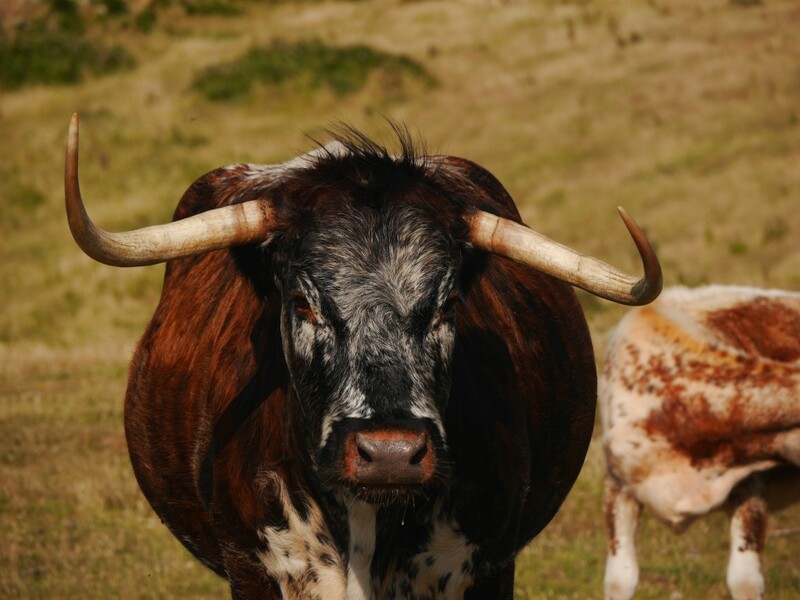 Longhorn cattle graze land as part of chough conservation measures in Cornwall. Photo by Liz Corry. 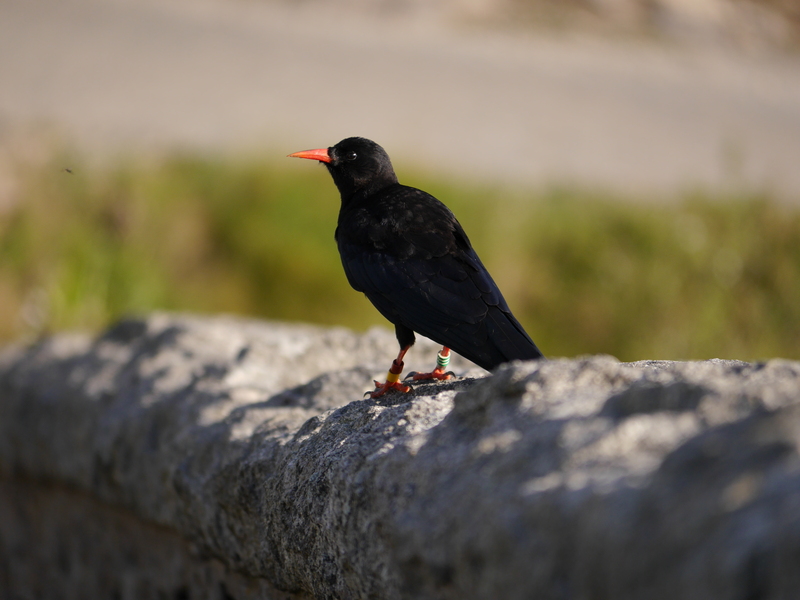 With food supplies in check, chough parents-to-be need secure nest sites. Generally these are in caves or deep crevices along the cliffs. 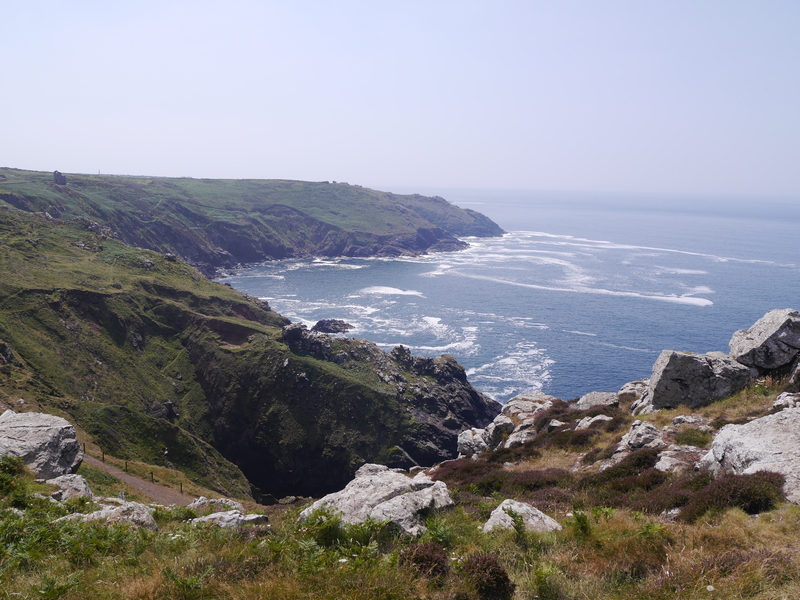 Cornwall’s coastline is abound with such features and the choughs often choose the most dramatic of sites, many of which cannot be accessed on foot by people providing the birds with a certain amount of security. We were taken to see a few such sites and marvelled at how Claire spotted the site in the first place, followed by how the licensed ringer accesses the nests in order to collect data on the chicks. 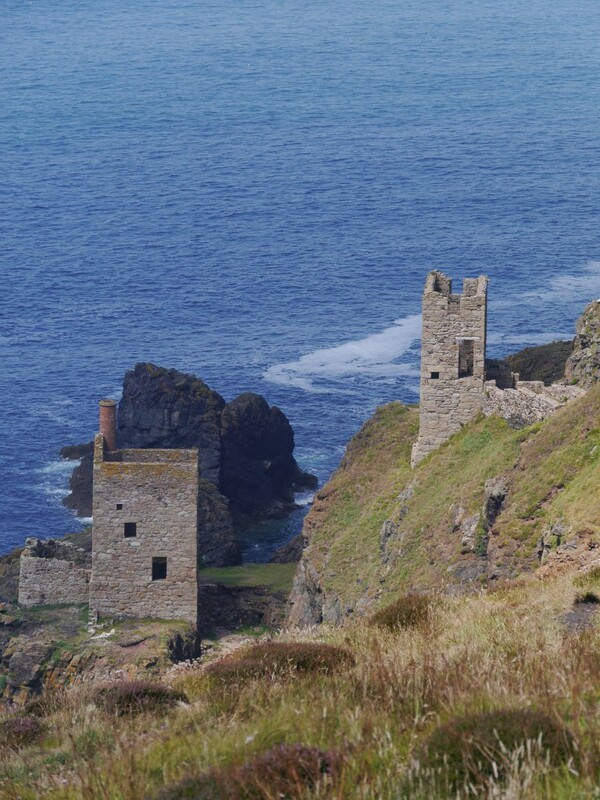 Abandoed tin mines, such as Botallack, are a common feature of the Cornish coastline. Photo by Liz Corry. 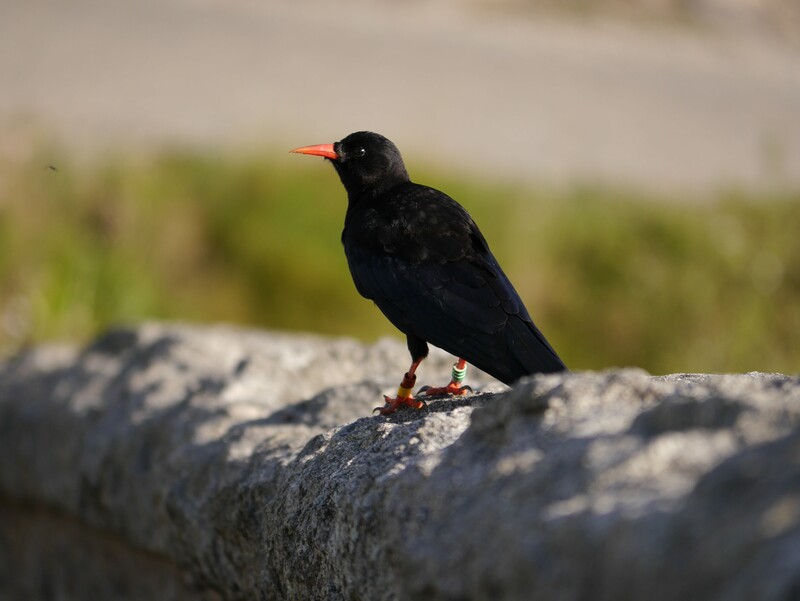 Choughs are quite resourceful and take advantage of Cornwall’s other offering of nest sites in the form of abandoned mines, adits, and other stone buildings. Our final stop on the guided tour was the Botallack Mine complex north of St. Just. These are abandoned tin mines built in the 1860s which run about 400m into the Atlantic Ocean. 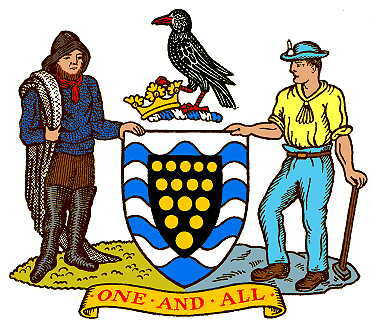 The area is now managed by the National Trust and home to Cornish choughs. The National Trust have secured all the old mineshafts, but it always pays to be careful where you walk in old mining areas. The deepest shaft at Botallack runs about 500m down into the ground. It is advisable to stick to designated footpaths. Choughs rarely like to abide by rules and where they nest in this area is certainly off the beaten track, barely accessible by humans. A perfect spot to safely raise chicks. Before heading home we couldn’t resist one final check of Cape Cornwall’s offerings. 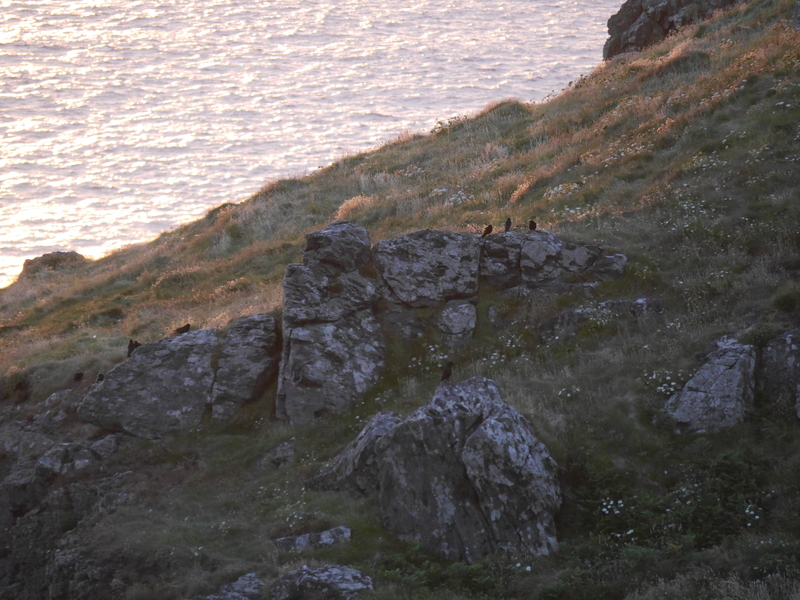 We only counted twelve choughs that evening as they dropped off the cliff edge out of sight down to the roost below. 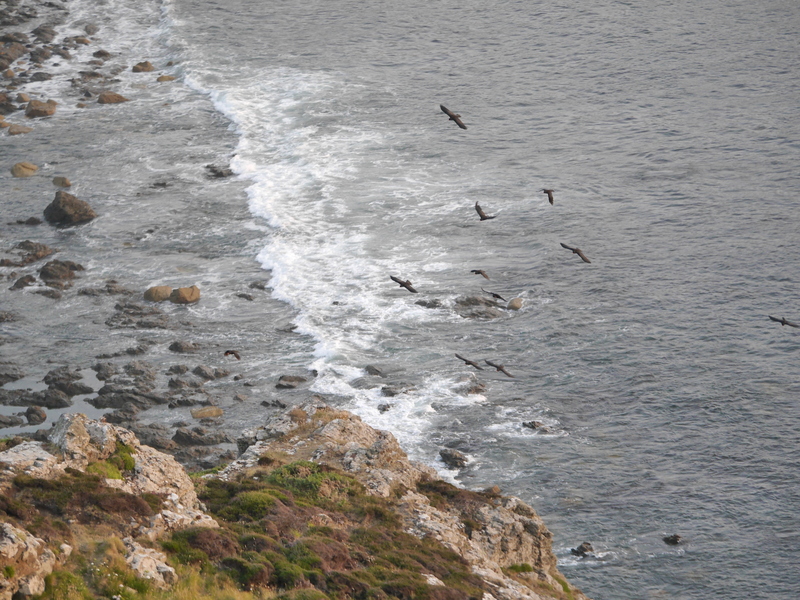 Choughs flying along the Cornish coast. Photo by Liz Corry. Whether one, twelve, or twenty-two it was amazing to see a bird that has been able to return home and breed once again. The population is nowhere near the numbers it used to be. However, thanks to the conservation efforts of the RSPB, National Trust, Nature England, the farmers and the people of Cornwall the number of choughs has gone from three to thirty-three in little more than a decade. 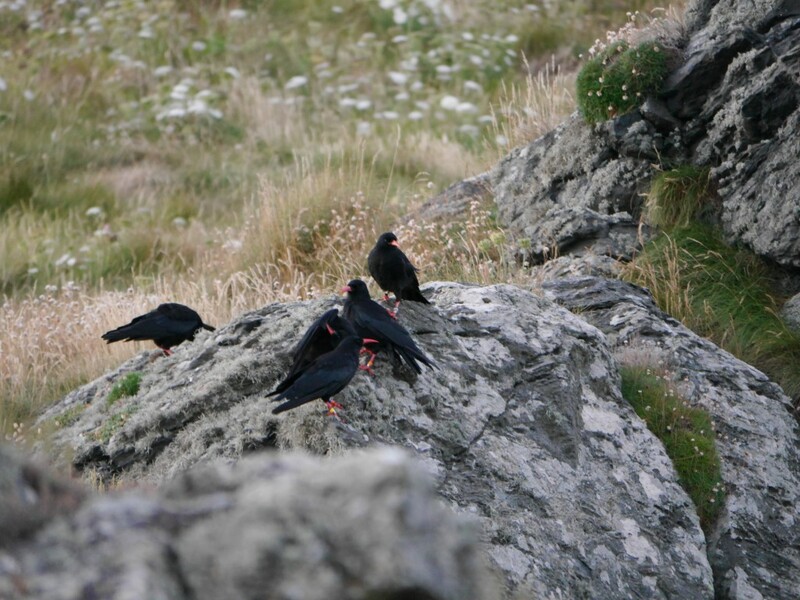 This entry was posted in Blog, Choughs, Top News by Glyn Young. Bookmark the permalink. Thanks for this report Liz, very interesting. We have a week planned to Jersey in the summer, but looks like a few days in Cornwall might be on the cards too! Best wishes to all the Project team. As a Devonian, I remain hugely impressed with the Cornish chough project and am delighted to hear that the Durrell ‘team’ so enjoyed the delights of the west country. Haven’t had the opportunity, as yet, to read your report in full although my eyes did briefly catch the locally brewed Cornish ‘chough ale’ (can’t think why). Could this be an opportunity for BOTE? Our local brewery would, I’m sure, be very responsive to any environmentally-sound initiative and the possibility of producing a local ‘chough ale, to me at least, seems an idea possibly worth pursuing – just a thought! Anyway, well done again for what looks like another interestingly good read. Thanks Liz, another reason to visit Cornwall and something to do as well as visiting relations. Good to read of the collaborations and exchange of ideas. I enjoyed the article. A fascinating update yet again, many thanks, great pictures.